We work hard to make sure that everyone can have a comfortable journey, whatever their needs. If you have a disability of any kind, or your mobility is reduced and you need assistance, you must tell us at least 48 hours in advance of travel or we may not be able to provide the help you need. Departure and arrival services vary considerably depending on where you fly. These services are provided by the airport and not by us so it’s really important you check the airport’s website to see if they have facilities appropriate for your needs. 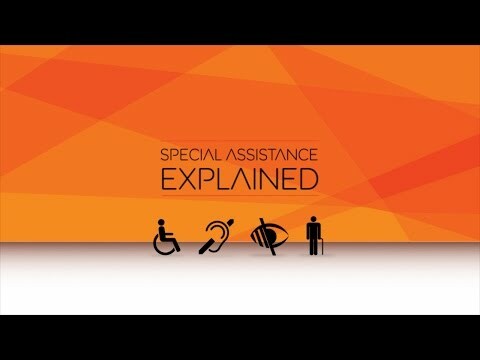 Special assistance explained in this short video. With easyJet we try to make travel as easy as possible, whatever your needs. Just supply us the right information at least 48 hours before you fly. Arrival and departure assistance services are provided by the airport. The services they provide differ considerably by airport location. It’s important that you familiarise yourself with the services they provide to make sure your needs will be met. Please take a look the airports’ website for up to date information. take you to a meeting point in the airport. We have to let the airport know what assistance you need at least 48 hours before you fly. If you give less than 48 hours’ notice, the airport may not be able to provide the service you need or you may have to wait a while for them to organise the assistance. So, please always think ahead and tell us how we and the airport can best assist you. Emailing us at special.assistance@easyJet.com with the subject ‘Special Assistance Request’. If requesting assistance via email, please do so at least 14 days before your flight. We’ll ask you detailed questions about the assistance you need. More information is available in ‘Additional information for those requiring special assistance’ below. You can also see what medical conditions you can fly with by looking at our medical information page. If you’ve booked through a travel agent or third party you’ll be unable to request assistance online. Please contact our Special Assistance team who will be able to assist you. If you have told us about your needs, we will select a suitable seat for you, free of charge. If you’d prefer to choose your own seat there are some restrictions on where you can sit. Use the toilet on your own. If we ask you to bring a travel companion, we guarantee their seat will be the same price as yours, even if they book it later. Please make sure you check if you need to have a travelling companion before you get to the airport. For safety reasons you may be unable to fly if you don’t have one. If you’re travelling with other passengers not requiring assistance, one of them may be able to accompany you through security and whilst boarding the aircraft. Please check with the airport directly on the day. If you have more than two mobility items, you’ll need to buy a hold luggage allowance for them. This can be done online through Manage Bookings. At most airports you’ll be able to bring your mobility equipment up to the aircraft door but it may have to travel in the hold for the flight. It will then be waiting for you at the aircraft door or in the baggage hall when you arrive at your destination. We recommend you arrive at the airport at least 2 hours before your flight departs. If you’re already in the terminal and you have luggage to go in the hold or you need to check-in, you can make yourself known at Bag Drop. If you’ve already checked-in online and are travelling with a cabin bag only, you can go directly to the airport’s Special Assistance desk. You’ll be able to find the location of the Special Assistance desk by visiting the airport’s website. If you are a wheelchair user travelling with your own chair, you’ll be able to keep it with you up to the door of the aircraft. Very large or heavy electric mobility scooters may need to be left at Bag Drop. At some of our airports there is a dedicated Special Assistance security ‘lane’. If you are carrying medication and/or medical equipment to take on board, please make sure you have a doctor’s note with you, listing your medication, and that it is packaged correctly. You should let the service provider know what assistance you need. They can accompany you in the departure lounge or make arrangements to meet you in advance of boarding the aircraft. Some of our airports also have a dedicated Special Assistance seating area in the departure lounge. We’ll get you on board shortly after our Speedy Boarding customers. This does vary depending on the airport layout and the type of assistance you need. Our Special Assistance providers will get you to your allocated seat and put your cabin bag in the overhead locker for you. Depending on the airport we may ask you to wait until the rest of our customers disembark. The assistance providers will then be able to help you to disembark the aircraft at your own pace. Depending on airport your wheelchair or electric mobility aid may be waiting for you at the bottom of the steps when you disembark or it will be in the baggage hall. Assistance will then be provided through passport control and to the baggage reclaim where you will be helped to collect any luggage or mobility equipment, if necessary. You will also be assisted from the baggage hall to your point of departure from the airport. At airports inside the European Union this can include the pick-up point, the bus stop or car park, for example. Our Cabin Crew are unable to help with eating, drinking, taking medication, or visiting the toilet. Our toilets have grab handles and rails, and we’ll be happy to help you to and from the door. We do have an on board wheelchair to help you get to and from the toilet; you must be able to transfer yourself from/to the aircraft seat and toilet compartment to the on board wheelchair. Currently the longest scheduled easyJet flight is 5 hours. Comfort aids (such as cushions) can be used on board so long as the aircraft seat belt can still be used. We don’t have any additional support systems on board, however, if you’re travelling with additional support systems, please contact our Special Assistance team who will be able to allocate you a seat suitable to the support system. Please be aware that if you are travelling to or from Berlin Tegel on one of our partner airlines, on board wheelchairs may not be available. Please contact our Special Assistance Team for the detail around your specific flight. Assistance will be available from the moment you arrive at the airport up until you take your seat on the aircraft. The same service is available to help you from the plane, through baggage reclaim and immigration to the point where you leave your destination airport. We recognise that everyone’s needs are different so please let the Special Assistance team at the airport know what your specific needs are. On board, Cabin Crew will take you through the safety briefing and will help you to locate the oxygen mask and life jacket and fasten your seat belt. They will also explain to you where your seat is located in relation to the emergency exit and the toilets and will help you make your way to and from the toilet. If you buy food or drink, they will help you to open the packaging. Our Cabin Crew will take you through a separate safety briefing on board. Our Cabin Crew have been trained to communicate with customers who are hearing-impaired and some may also be able to communicate in Sign Language. If you have a learning or cognitive disability or a condition such as dementia, you should only travel alone if you are able to understand and react to safety instructions on board. It is also very important to think about all aspects of the journey, including finding your way through the airport, which can be confusing and stressful. The environment in the airport and on board an aircraft can be very confusing and upsetting to people who may not understand where they are and it is advisable that you travel with a companion. Assistance can be provided at the airport, including baggage retrieval. Please be aware that one-to-one personal care cannot be provided on board. If you are not sure whether you, or a relative or friend, should travel alone please call our Special Assistance team for advice. As epilepsy is a very individual condition it is important to think about how all aspects of your journey might affect you. Some people’s seizures might be triggered by tiredness, excitement or anxiety, which can affect some people when they are flying. Some people with epilepsy choose to carry an ID card or wear medical jewellery that explains how someone can help them if they have a seizure. If there is a chance that you might have a seizure, it is advisable that you travel with a companion who knows how to help you if a seizure happens. We recognise that everyone’s needs are different so please contact our Special Assistance team prior to traveling or let the Special Assistance team at the airport know what your specific requirements are. There are some important differences between US law and European Law on access to Air Travel. In Europe the airport are responsible for providing assistance from your arrival at the airport, to your seat on the aircraft and from the aircraft to your point of onward travel. We are responsible for passing on your request for assistance to the airport and for assisting you on board the aircraft. You should let us know if you need assistance at least 48 hours before you fly. How do I complain if something goes wrong? Need to make your complaint directly to the airport if it is a in a European Union country (Austria, Belgium, Bulgaria, Croatia, Cyprus, Czech Republic, Denmark, Estonia, Finland, France, Germany, Greece, Hungary, Italy, Ireland, Latvia, Lithuania, Luxembourg, Malta, Netherlands, Poland, Portugal, Romania, Slovakia, Slovenia, Spain, Sweden, United Kingdom) as well as Iceland, Norway and Switzerland. You can find the customer service contact details for the airports on their websites. Should not make your complaint to easyJet. Even though you may have booked the assistance through us, under European law the airport is responsible for the service. If you have problems at an airport outside of the European countries listed, you should complain to easyJet by contacting our Special Assistance Team. We are responsible for the assistance teams provided at these airports. If you have a complaint about anything that happened on the flight, or any staff while you were dealing with us, you should complain to us. You can do this by contacting our Special Assistance Team. If you are not satisfied with the way your complaint is dealt with either by us, or by the airport, you can also complain to the Civil Aviation Authority (CAA). If you’re travelling out of Switzerland, you’ll need to direct your complaints to the Federal Office of Civil Aviation (FOCA) Passenger Rights. You will need to provide official documentation which confirms that your recognised assistance dog meets the requirements of the EU Pet Travel Scheme Regulation. You will need to provide official documentation which confirms that your recognised assistance dog fully meets the requirements of the UK Pet Passport Scheme. You will not need documentation from the UK Pet Passport Scheme on domestic flights within the UK. Due to local customs regulations, recognised assistance dogs are not permitted on these routes. . Please let us know no later than 48 hours before your flight is due to leave if you are travelling with a recognised assistance dog. See our ‘How do I request assistance?’ section. Please make sure you check in at least 2 hours before your flight is due to leave so there is enough time to complete any paperwork.